Pola RED BA (I will tell you soon) is fantastic, and I also bought some of new Cosme Decorte AQ line, what is just released Sep 2017 for this Autumn/ Winter. I got some samples of this AQ products before of the release, and switched my budget for this Autumn-Winter of Albion Excia AL Renewing kit & Excia Superior foundation to this AQ line. Mine is Cosme Decorte AQ Emulsion ER, and there is also AQ Emulsion, mine is richer, aka more moisture type. Now, Sep pf 2017, I am using AQ Emulsion ER 2 pushes for whole of my face. It is already September. Sooner or later, it is going to be cooler and more and more drier in here, this is the reason why I chose not AQ Emulsion but this AQ Emulsion ER, in other words the extra rich type. When my skin is so dry, I can add extra few pushes, and when my skin is not so much drier, I can use less. It is not new for me that the method of Albion/ Cosme Decorte, and the floral scent of this AQ is posh and not strong (than AQMW or Excia AL). Of course there are no irritation for my sensitive skin. I do not promise it never harm for you, but so far, it is good for me. But I do not recommend if you are an oil prone. For my drier skin, I need oils, indeed it can be too much for some of you. Afterward of this AQ Emulsion, my skin is moisturized well, and am so satisfied. I feel my skin condition is better oil & water balance. Of course I did not feel anything irritation. There are some Albion/ Cosme Decorte milks/ emulsions, using for the same way — Milk (Emulsion) first, and the Lotion later. Please let me compare some milks. This “AQ Emulsion” line, there are two types, simply “Emulsion”, and “Emulsion ER”. What I bought is “Emulsion ER”, the ER means Extra Rich. this formula is for super dry skin, and I bought it again at Jan of 2018. I also got a sample of “Emulsion”, it must be lighter, indeed it does not meaning it is not oily. 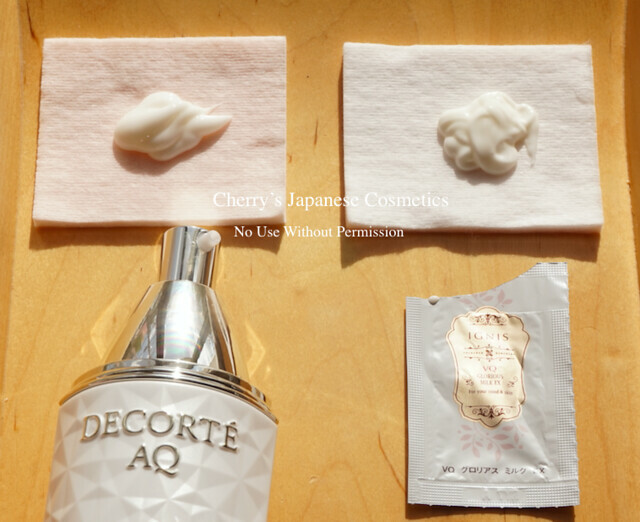 Cosme Decorte AQ Emulsions are oily products. Due to this cold weather, I am writing this section with seeing snow on the air. The texture of ER is harder than the pictures what I took in September 2017 to November 2017 you may see after this section. I used all of the package of “Emulsion”, and ER side is 4 pushes with seeing the quantity. On my face, I found it is exactly they are difference. I felt both of my sides afterward are smooth and well moisturised. But ER side is more and more richer and oilier, and the Emulsion side is simply smoother. My skin condition is better as the season of Jan, but I need add oils to keep this condition. In person this “ER” is mine. AQMW is also a lovely line, and asked a BC of Cosme Decorte whether they continue AQMW or not. According to her, AQMW is continued, but remember the price zone is the same. 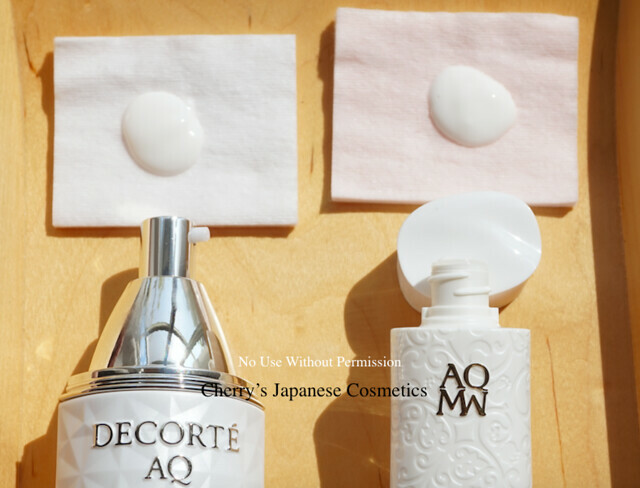 Long ago, there were “Cosme Decorte AQ”, it was discontinued few seasons later of the release of “AQMW”. It may be happen for AQMW. It can be discontinued sooner or later. We are dealing many products, and checking & chasing the products update is not easy. We decided to stop dealing the AQMW Repair line, but if you want us to get AQMW Repair line, please fell free to ask us. Anyway, let me compare Repair Emulsion ER, the richer one. This bottle of AQMW Repair Emulsion ER is for the kit of 2016. According to the BC, they have no plan to sell the lovely kit in this year of 2017. There are many items I needed to done, and I did not open the bottle until now. The two pushes for the AQ, and almost the same quantity for the AQMW. Albion recommends to use 3 pushes for their milks, but Cosme Decorte does not so much “push” the quantity of using. I also think you can control as you want, and for current skin condition, 3 pushes for one side is too much. I pushed twice. The biggest difference is the scent. AQMW is with Sandalwood, I liked it so much, but AQ is floral. AQMW is stronger scent, but AQ is less stronger than AQMW. Checking what Japanese reviewers are saying, some says the scent of AQMW is unacceptable, but this AQ is great. The second difference is the texture. AQ is more runnier than AQMW. AQMW is also runnier than other milks, but this AQ Emulsion ER is more than AQMW. But on my face, both moisturized pretty well. Fantastic job. In this point, there are not so much big difference. I kept Renewing Emulsion ER for comparison, guess I can compare three times or so 🙂 Because the milk of Albion is in an inner bag of this bottle. It may be out from the air and sunshine, and keeping in a darker and drier place, it will be fine for spending for few months. Let me use a cotton, as their recommend. Albion says 3 push is a basic use, and add as you want. Indeed for my current skin condition, 3 pushes each of my half face is too much — total 6 pushes, aka double of their recommend, I took 2 pushes each. You can see AQ is really soft and runny, and Excia is a little bit harder. Both are oilier products, and I felt Excia is a little bit sticky afterward. I do not say AQ is not sticky 🙂 Both are for the person who has dry skin. For combination skin, both are too much for you, I guess. I felt Excia AL is stronger. I like the floral scent of AQ more than Excia AL. Sadly, I have a sensitive skin, and I often get sting by cosmetics. Fortunately, so far, there are nothing like that from both Excia AL Milks or Cosme Decorte AQ Emulsion. My skin condition is more than better now. My skin is drier recent few years, but my T Zones are really oily. I am feeling my skin is now dry-combination. Both are a little bit too much, yeah, total 4 pushes for whole of my face is too much quantity 🙂 Now, Sep pf 2017, I am using AQ Emulsion ER 2 pushes for whole of my face. Just comparing both AQ & Excia AL Extra Rich, I feel AQ is better for my preference. I like the scent of AQ more than Excia AL. Simply this is the reason why I bought this AQ Emulsion ER. But totally to say, if you are using Excia AL Renewing ER and satisfied, you have no need to switch to AQ Emulsion ER. I was asked the difference between this AQ Emulsion ER and Exage Activation Moisture Milk. 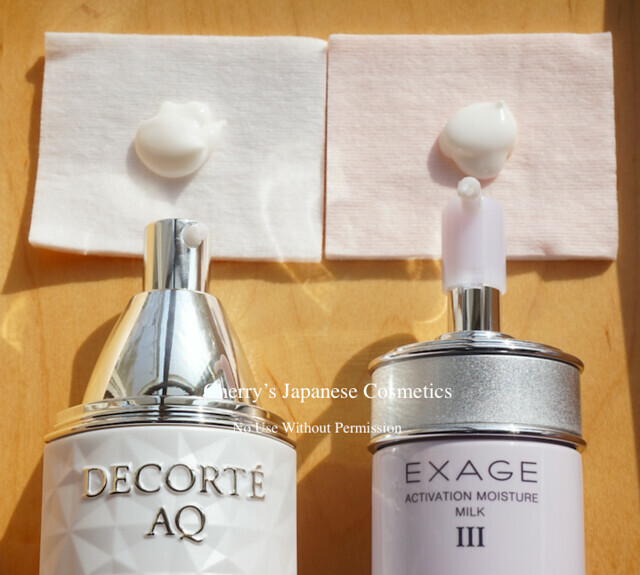 Due to the price zone, I know some of the repeaters of Excage milks are stepping up to Cosme Decorte AQ or other products. 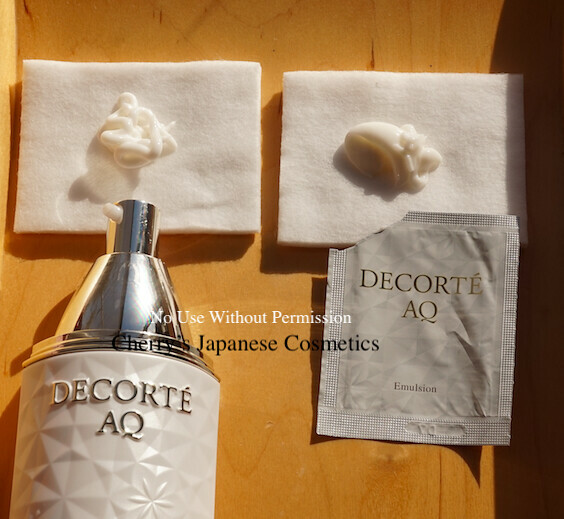 What I carry now is Cosme Decorte AQ Emulsion ER, simply I compared with Exage Milk #3. Both are two pushes each. Both are wonderful milks, and the biggest difference is the scent. Both are floral, and I like the posh scent of AQ. 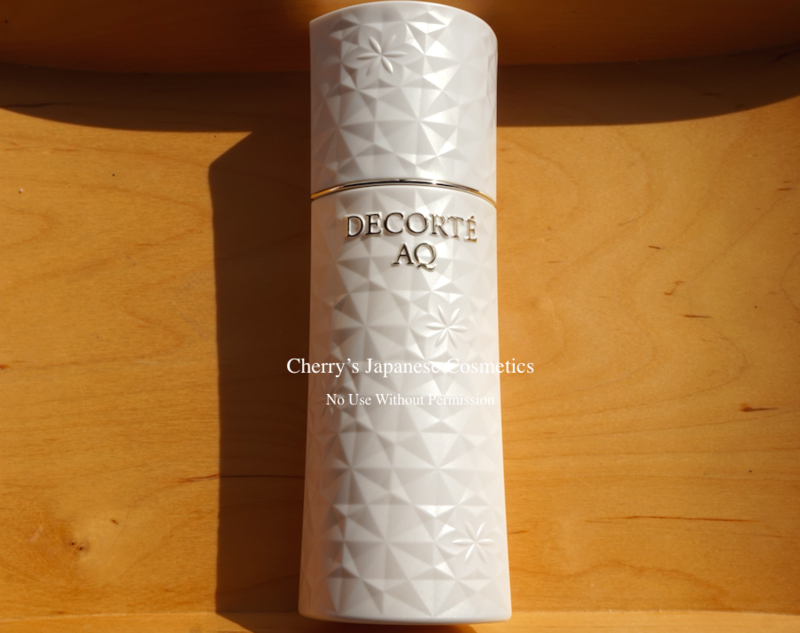 This scent is one of the biggest reason why I use Cosme Decorte AQ. The texture & my skin afterward are surprisingly not so much big difference. To know the difference, I thought Exage #2 may be better. At least in this stage, if Exage #3 is fitting to you, this AQ Emulsion ER is too expensive for the performance, I thought. Yes, Exage #2 is lighter than Cosme Decorte AQ Emulsion ER. 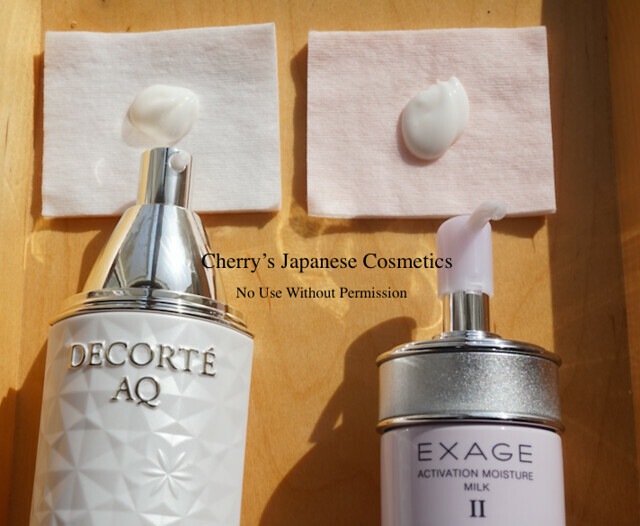 I thought if you are satisfied with Exage Activation Milk, I guess this Cosme Decorte AQ Emulsion is simply too expensive. I am not satisfied with Albion milks, on the view point of the scent. I like this one. If you want to know the different between this Cosme Decorte AQ Emulsion ER and Infinesse Derma Pump Milk, please check this article: Albion INFINESSE DERMA PUMP MILK is the quickest to be smooth among Albion milks! Ignis Glorious Milk EX is for brightening, but I compared with AQ. Whole od the package for Ignis VQ, and AQ side is 3 pushes. I found the AQ Emulsion ER side is “lifting” up. Both side are oilier but different kind, VQ is a little bit slippy. AQ is a little bit smoother. I also like the scent of VQ. Both are wonderful. I had compared with this emulsion with other products. Please also check them. Please check the latest price, and order from here: Cosme Decorte AQ Emulsion. Wanna order by Japanese Yen? Visit our JPY Branch too!